The silver price per ounce today (Wednesday) tumbled into the red as concerns mount over China's economic slowdown. At 2:50 p.m. this afternoon, the spot silver price per ounce was down 0.2% and trading at $14.73. 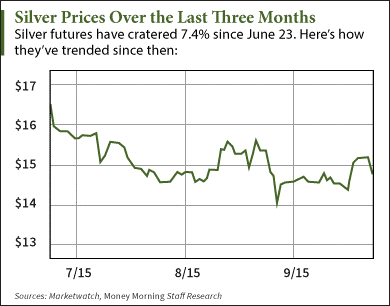 Silver futures – which trade 5,000 troy ounces per contract – were down 0.1% to $14.75 today. Futures have been extremely volatile recently. They hit a six-year low of $14.11 on Aug. 26, two days after most major commodities hit their lowest level since 1999. The decline in silver prices today comes as more weak data pours out regarding China's economy. The Caixin Manufacturing Purchasing Managers' Index – a gauge of nationwide manufacturing activity – fell from 47.3 in August to 47.0 in September. That's the lowest level since March 2009, when the world's second-largest economy was sinking from the Great Recession. Today's report follows Sept. 8's weak trading numbers, which showed August imports plunged by 14% from a year ago. Like most commodities, silver is priced in U.S. dollars. That means Chinese silver imports become more expensive when China's economy falters. As one of the world's largest consumers of major commodities like silver and oil, China's weak data could depress the silver price per ounce if it continues throughout the rest of the year. Despite the bleak short-term outlook for silver prices, the metal is still a healthy long-term addition to your portfolio. You see, many traders don't understand that silver isn't meant to be played for explosive profits. In general, bullion is a way to diversify your portfolio and provide an asset uncorrelated to broader market volatility. According to Money Morning Defense & Tech Specialist Michael A. Robinson, buying physical silver is a healthy investment regardless of where the price moves. It's also less risky than trading future contracts as a speculator. "I have physical silver," Robinson noted. "I might have bought some at the top, but I don't care where the price goes to; I will not sell that physical silver. It's there for a reason – just like I have insurance on my car, I have insurance in case of a disaster." There are plenty of benefits to buying physical silver, but the biggest one is how it can insulate you from erratic market behavior. own silver calculate a year's living expense own that much. Manipulators of the silver commodity will surely……………………………………. Silver and gold are the only true money. I have never considered either an investment. They are insurance. All fiat money is just paper. Gold is too expensive as a medium of everyday trade thus I own mostly physical silver. I think silver is an excelllent investment. I am interested in physical silver. They say it will drop to $10.00/once, mainly because China has droped their currency.What do you think? All commodities are in a down cycle now. The question is, how long will they stay down. I purchased 1000 oz of silver in 1990 for 5.25 per oz. I sold 300 oz in 2011 for $36 an oz. Silver hit about $48-49 about three to four months earlier. The nice thing about silver is that it is an industrial metal as well as a currency so to speak and a hedge against inflation. If it were to drop back below $10, I would purchase 500-1000 oz again. If it goes over $40, I will sell 30-50 of my position. I believe inflation will be coming down the road sooner than we all think it will. I have traded an ishare symbol slv a few times as well. I believe I am currently long about 600 shares at around 17 and change. At some point, demand will exceed supply down the road or inflation hits or wars occur and silver and gold will have their day again. Just do not know when. 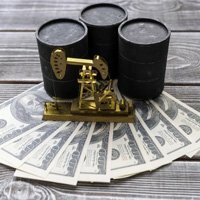 Are you aware you can 'own' 1000 ounces for about $1400 on the exchange? Assume you are referring to options? I don"t think that anybody here really knows what there talking about. The only way that sliver will go up, is if the federal government lets it. Just do your on thing. Buy and hoard if you can, and do nothing if you can"t. Then we will wait and see who is right. That sounds too good to be true, as the saying goes but I'd like to know more. Been buying my silver from outlets such as Kitco, Silver.com,JD etc. this is my first time on this site but sounds like it's "old news" literally. It's Feb 13, 2016, so if this is up to date I know quite a bit about coins, bullion, etc nut almost nothing on how to buy silver on the exchange, can you or someone explain please. Junk silver coins are the best insurance against catastrophe. you won't want to buy a Tank of gas for an ounce of gold. Fifty five years ago a silver dollar would buy four gallons of gas, today it is about six gallons. The junk silver coins sell at a premium to the melt value and that premium has been rising.